Hetton-le-Hole lies about 6 miles north east of Durham and 2 miles south of Houghton le Spring. It is accessed via the A182, which links to the A690 providing access to the A1(M) at junction 62 about 5 miles to the west. 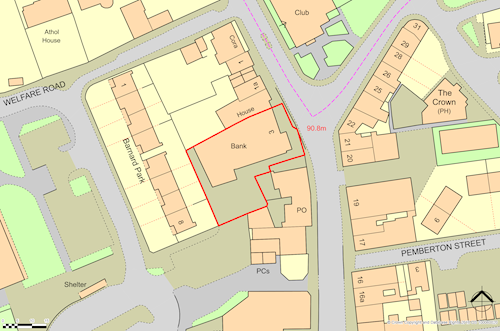 The property is situated on the west side of Front Street in the town centre opposite its junction with Caroline Street. Nearby occupiers include Tesco Express, Greggs, Coral and Heron Foods. An end of terrace building of modern construction arranged over ground and first floor. The building provides a ground floor banking hall with ancillary accommodation on the first floor. Externally there is a car park to the side and rear providing parking for about 9 cars. The property may offer alternative use potential, subject to obtaining the necessary consents. Prospective purchasers are advised to make their own enquiries.